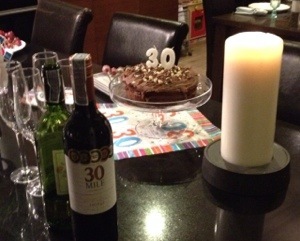 Yesterday was my 30th birthday. I had a wonderful day and was made to feel very special! As I leave my 20s behind I’ve been thinking about the last ten years. I don’t remember my 20th birthday. I think I was pretty excited to leave my teens. I don’t know that I ever sat down and thought about my expectations for my 20s, but I can tell you the major milestones I assumed I would see: graduation, marriage, a baby or two. Although these assumptions were pretty accurate for many of my friends (and as a side note, I so appreciate my friends who enthusiastically include me in their family life), I only managed the first one. Even though there were times in my early 20s when I really struggled with not having met ‘the one’ (a concept I’m not so sure I believe in anymore), I can honestly say that I’m extremely thankful that my life didn’t go the way I assumed it would, because I don’t think I would have ended up the person I am now (who I quite like, most of the time). It appears that God knows what’s best for me better than I do! To write down all the experiences – and more importantly, the people – who have shaped my 20s would take hours, maybe even days, so instead I want to mark down a few important milestones. The summer I was 20 I was asked to be a team leader at a local summer scheme (after being on the team since I was 16). Actually I agreed (reluctantly) to cover as team leader for the first two days, but somehow ended up doing it for the whole two weeks! At 23 I started co-coordinating the summer scheme. I developed practical wisdom about leadership and working with kids, but I also learnt that people believed I could lead – something I hadn’t expected and didn’t understand. This milestone was incredibly influential in my development and belief in myself as a leader and I was blessed with awesome mentors. Also at age 20, I studied in France and then in Spain as part of my degree. Although I didn’t know it at the time, this laid a foundation for me to become a missionary, as I learnt that home is anywhere I am because God is always with me; as I watched other missionaries live incredible lives in very different ways than I had imagined; as I attended language school; as I learnt how to live well in a different culture; as I discovered Skype! Again at 20 I was diagnosed with Coeliac Disease. The day before I left for France in fact. When I was almost 22, God healed me. Amazing! This is a longer story than I have space for in this post, but you can listen to me talk about it here. I graduated at 22 and started my teacher training. The summer I graduated I attended at least four weddings (and couldn’t make it to one or two more). It feels like all I did was attend weddings in my early 20s! I qualified as a teacher and moved back to Northern Ireland at 23. Starting over in the place you’ve called ‘home’ all along is a strange and not-so-fun experience, but it was worth all the effort. The relationships I have there are beyond what I could have imagined or hoped for. That year, I invested in relationships more than activities, especially my relationship with God. I learnt that my identity is not in what I do. I realised that I had spent most of my life feeling inadequate and unlikable, trying to please everyone but never believing I had succeeded. I learnt that I didn’t have to live like that. I learnt that there are people who genuinely think I am amazing, and even started to believe them. I learnt that I didn’t have to live with the sadness and hopelessness that had characterized my life for the past few years. I learnt the meaning of God as life-giver and joy-bringer. It was like emerging from a desert, spiritually. I’m still learning how to walk out what I learnt that year, the year I was 26 turning 27. One of the unexpected outcomes of that year was this blog. As I shared what God had done in me more and more publicly, I was overwhelmed and humbled by the response. It became clear that my ‘little’ story could impact other people’s stories – I never dreamt God could use me in this way! That’s partly why I blog – in the hope that my journey might make a difference to someone else. You can read more about one of the highlights of this significant year of my life here, or listen to me share here, or even watch me (very briefly) on video here. Just before my 27th birthday, my sister got married. It was an incredible day and an important milestone. Even better – and I could never have imagined how mind-blowingly amazing this would be – at 29 I became an auntie. I have never loved someone so instantly and so completely – my niece stole my heart the moment I first laid eyes on her. My world is infinitely better with her in it. To finish my year of restoration I had a 6-week holiday visiting friends in the USA and Canada. It was incredible in many ways, but the lasting impact was that I realized (or rather, remembered) that I was called to mission during this trip. It was also the time when some of my misconceptions about me doing mission were corrected. For example, I finally figured out that I didn’t have to wait to get married before I could consider becoming a missionary! So the trip became a catalyst that led to what I’m doing now. There’s plenty on this blog already about my Thailand journey – the year I spent seeking God and exploring what He wanted me to commit to long-term by volunteering at a community development project in Chiang Mai and then completing a YWAM DTS (Discipleship Training School) in Bangkok. Watch me talk about it here. I fell in love with Thailand and it’s people and moved back here 6 months ago to become Education Director at ARK International. It’s amazing how God has drawn together many of my experiences and skills to make me ready for this role and this life. This has been the cry of my heart for the last ten years. God has never let me go and He never will. To all the people who have impacted and influenced me over the past ten years, whether we’re still close or haven’t talked in a long time, thank you. I haven’t forgotten you and I wouldn’t be the person I am today if you hadn’t been in my life. I’m sorry for the times I’ve frustrated or offended you and I forgive you for the times you have frustrated and offended me. May you be blessed as you journey through life and may God reveal Himself to you in new ways. This entry was posted in Hopes and dreams, Identity, Journey, Joy. amazing testimony you got there Gillian! i’m inspired! Thanks Joan! You are always so encouraging! love hearing God’s story in your life, Gillian! Thanks Amy! It’s definitely been a much more amazing story than I would ever have imagined! Thanks Ali! I hear 30s are pretty awesome – I’m excited to see what’s ahead!